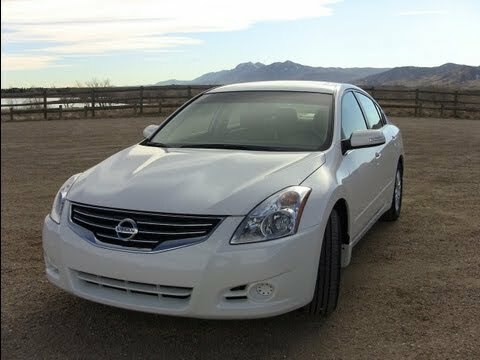 If you're seeking a sleek and efficient coupe that is a bit more sophisticated than the traditional 2-door muscle car, the 2012 Nissan Altima Coupe is for you. It's not hard to mistake a loaded V6-powered Altima Coupe for a much more expensive premium car. Short and sweet for your day commute. It is great the only problem would be the recalls, the air condition work better on cold then hot, and it great on gas! I only have to put ten dollars a week in my tank, it is amazing compared to a truck that take like 50 dollars. One other problem to note my had a heat shield and it snap off causing some stress but I fixed it with some washers. It handles great! It provide a smooth drive through and through although I would prefer a bit more space in the trunk and in the front drivers side; it's great for smaller driver but taller drivers seem to struggle a bit! So recommend this for shorter people! The seats are comfortable and adjustable there is a lot of legroom in the back seat which is great for friends and family! It is great during all weather and is build well, I hit a curb during some rain and it did not take an damage. It overall is a great vehicle and would recommend to friends and family, it is a great pick for those looking for a car with great handling, a lot of space, and even better on gas! I love this car would not trade it for the world another great thing in the spare tire space in the truck it will also how a small jack I recommend replacing with small but more user friendly version! Another tad bit is that it has tire sensors so if your tire goes flat it will tell you right away! It nice for those who live life on the run and drive to place where nail are always a hazard! Overall it is a great daily driver! I am not impressed with my Nissan Altima 2012! I have had a lot of issues with my 2012 Nissan Altima. About 6 months ago while I was driving my car, the car stopped in the middle of the road (very scary!). The engine was still running, but all electrical parts were off. Turns out the "main computer" of my car had completely fried. Took to the shop, and they had no idea why this happened but after 12 days of being in the shop, they were able to fix my car. I have also just not been impressed with how it drives, especially in poor weather conditions (rain, ice). I am constantly adding more air pressure into my tires. Overall, it's just a "piece of crap" car that I am essentially driving into the ground once its paid off. Cannot wait to get a new car! It has cruise control and you can still gear down as if using a stick shift. My Nissan Altima 2. 5S is a beauty. Performance wise it is a quick starter and is very silent on idle. It runs like a stallion even when it needs servicing and parts. It is very reliable. All the seats are comfortable and there is more than enough leg room in front and back. The trunk is also very spacious. All doors have a cupholder which I like plus there are additional cup spaces in the pull down slot on the back seat. I didn't mention the Audio system. While I am no expert I think the system is very good and more than loud enough. It appears to have a built in subwoofer. Attach your gadgets and you can do hands free calls play music as well as listen to your choice of navigation system. NISSAN WILL REPLACE THE TRANSVERSE LINK BOLTS AND NUTS AND TIGHTEN THEM TO THE PROPER TORQUE SPECIFICATION FREE OF CHARGE. THE SAFETY RECALL IS EXPECTED TO BEGIN ON OR BEFORE AUGUST 1, 2011. OWNERS MAY CONTACT NISSAN AT 1-800-647-7261. Nissan will notify owners, and dealers will tighten the bolts to the proper torque specifications. The safety recall is expected to begin on, or about October 29, 2012. Owners may contact Nissan Customer Service at 1-800-647-7261. NISSAN WILL REPLACE THE AIR BAG CONTROL UNIT FREE OF CHARGE. THE SAFETY RECALL IS EXPECTED TO BEGIN ON OR ABOUT AUGUST 22, 2011. OWNERS MAY CONTACT NISSAN AT 1-800-647-7261.